Pick up from Railway station at around 10:30 Am and depart for Agra by surface approx. 200 kms./ 4 hrs. On arrival check inn at hotel. 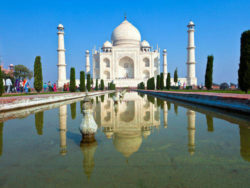 Later visit Taj Mahal and local market place. Overnight at the hotel. Morning after breakfast visit sightseeing of Agra i.e. Akbar’s Tomb, Jama Mosque, Agra Fort, Fatehpur Sikri etc. Afternoon cehck out from the hotel and depart for Delhi by surface approx. 200 kms. / 4 hrs. On arrival check inn at hotel. Evening free for shopping. Overnight at the hotel. After breakfast leave for local sightseeing Red Fort, India Gate, Rashtipati Bhawan Chandni Chowk- Jama Mosque, Swaminarayan Sanstha, Humayun’s Tomb, Lodhi Gardens, Shree Adya Katyayani Shaktipeeth, Akashdham, Overnight at the hotel. After breakfast check out from the hotel and leave for half day Delhi Local Sightseeing i.e Qutub Minar, The Lotus Temple. Evening drop at Airport.